During the bushcraft weekend you'll use your knife and other tools to make some very useful items, developing your tool use skills. 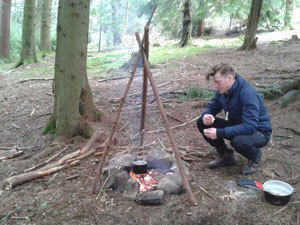 You'll sleep in your shelter, get your fire going again in the morning and cook your breakfast on it. You can also book privately for dates that suit you better. More information on private bookings. Please note you will sleep overnight in the tarp shelter you make. You’ll cook bread cakes, smoke fish, make soup and do a bit of barbecuing and baking as well as have a brew up. We’ll add a few seasonal wild ingredients as available. Further information: Participants should be 18 or over. Bring a packed lunch for Saturday and Sunday. Price doesn't include food ingredients which you will need to bring yourself.